Porsche 911 GT3 is one of the fastest performance sports cars in the world. 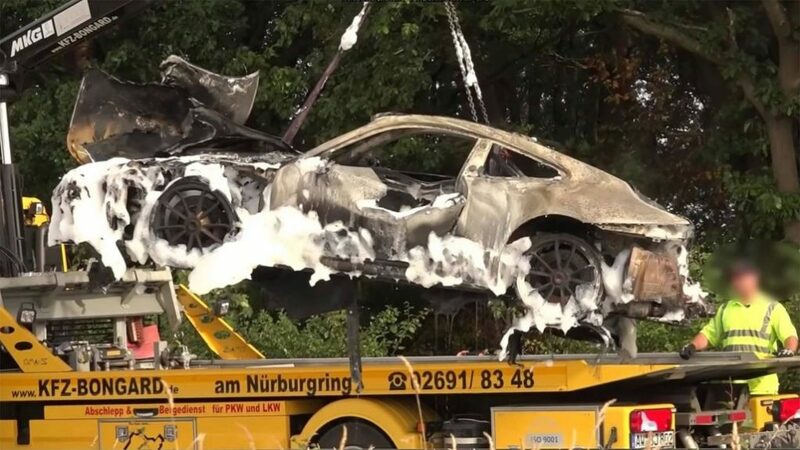 A 991 generation of 911 GT3 caught fire at Nurburgring on September 16. The burning 911 GT3 was caught on video and it was uploaded on Youtube. According to the description, smoke was coming from the engine and then the driver pulled to the side of the track. Luckily the driver escaped before the fire and the fire crew took more than 15 munites to reach the burning GT3. Initially, they used water to stop the fire and then the firefighter cut through the body to completely extinguish the fire, the only thing left was the shell and it’s a total loss for the owner. The incident happened on the track, which is considered as a public road but some insurance companies in Europe don’t give compensation for incidents happened at the track and we hope that the owner might get some money as 911 GT3 is a very expensive sports car. The cause of the fire is still not known yet, but the 911 GT3 had a troubled past. 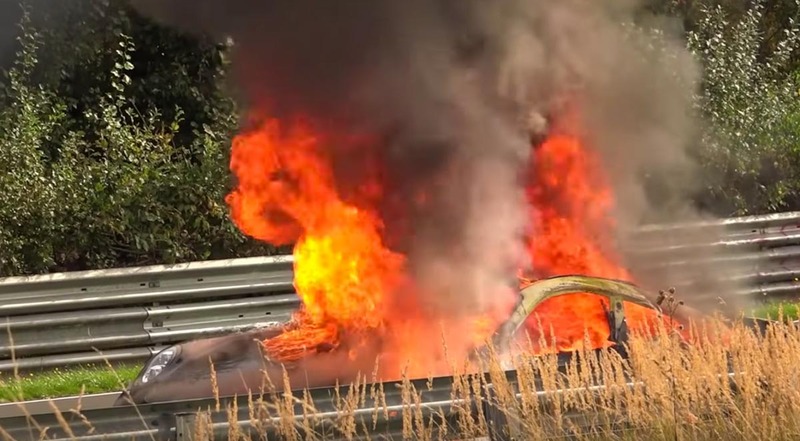 In 2014, so many 911 GT3 were caught on fire and the problem with connecting rods, which will crack the engine block and leaked oil in the exhaust system, is the reason for the fire. The German manufacturer had to recall all 785 units sold till then and the engine had to be replaced. The replacement took only one day and all the changes were done free of cost. Whether these problems exist in models sold after 2014 is unknown and there were no reports or incidents with 911 GT3 after that. So this might be a one-off incident and we will get more details in coming weeks. The current generation Porsche 911 GT3 is powered by 3.9 L 6 cylinder engine producing 500 PS of power at 8,250 rpm and 460 Nm of torque at 6,000 rpm. This engine is mated to manual and PDK gearbox, 0-100 kph in 3.4 sec (PDK) & 3.9 sec (manual). The top speed of 911 GT3 is 320 kph (manual) and 318 kph (auto).